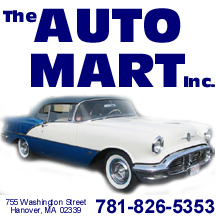 The Auto Mart has built a solid reputation in customer satisfaction. We've achieved this through quality work, attention to detail, and prompt service. Our low overhead allows us to pay cash for our inventory, which in return helps us keep our prices low for our customers. If you have any questions or comments, please feel free to call us. 781 826-5353 We look forward to hearing from you!